The Retail Network is committed to providing the highest level of service to our clients and candidates. Our consultative approach to recruitment is never pushy or forced, rather it focuses on trust, integrity, communication and relationship building. The Retail Network offers a variety of free services to job seekers. Our goal is to partner with you along the way to provide you with industry expertise, advice and coaching to ensure your job search is a successful one. Click here for more information about partnering with The Retail Network in your job search. Finding & securing top talent is no easy task. It requires a deep understanding of the company culture and an expertise in assessing the skills, leadership style, and cultural fit of candidates. 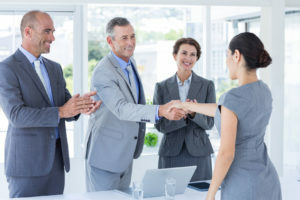 At the Managerial and Executive Level, this is even more important as the new hire will have an impact on the culture and the strategic decisions of the company. Click here to find out how The Retail Network can help you identify the best available talent in the retail industry. The Retail Network offers customized services for specialized search assignments tailored to the needs of individual companies including flat fee recruitment, outsourced recruitment contracts and sourcing only contracts. Please contact us for further information. We are happy to discuss your needs and provide the recruitment service that best meets your needs. Gary was an instrumental partner in advocating my talent system, skills and passion to any interested organizations and helped me shape my career plan, before, during, and even after the recruiting process. He evaluates leadership capability, employee development, operational skill, and work/life balance for every new candidate, and develops a plan for success, with a very personal touch. I am proud to ascend to the next level in my career thanks to Gary, and I highly recommend Gary to attract, recruit, and develop new talent for any organization. Gary is a highly accomplished professional recruiter and has a long history of successfully matching organizations and individuals for mutual success. His keen understanding of what I call win-win recruiting comes directly from his commitment to “mutual right matching” (my term) – not resting until he gets a match that is best for both sides. Gary is a wizard at matching hiring managers with qualified candidates. During the process he is informative, timely and produces results.